Why Spend on Highways When Local Streets Are Empty? This picture shows the height of the morning rush hour last week in Buffalo on Genessee Street. This is less than a mile from downtown. There are no moving cars in sight and there rarely are. This is not a special situation. The street is not closed. This is the norm. 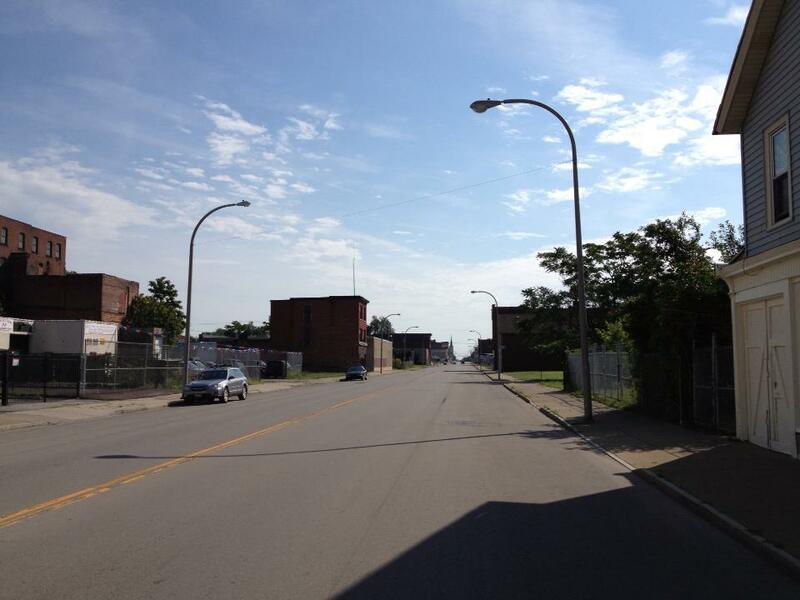 This is also the norm for William Street, Broadway, Seneca, Clinton, and many other Buffalo streets. Kids could easily play street hockey in the middle of these streets in rush hour with little hassle. These streets all used to be major business routes in and out of the city. At one time they were packed with commercial and industrial establishments and very busy with cars and people at all times of day. The emptiness of this street and others like it is the result of 60 years of disinvestment in the city combined with over investment in auto-centric transportation infrastructure. The Buffalo metro region has built far more roads than it needs and more than it can afford to maintain. This empty street is the image of absurdity and is proof that the nearby Kensington Expressway abomination is not needed. There should not be a highway trench where a parkway used to be especially with so much unused roadway infrastructure nearby. The people of the city of Buffalo do not owe their civic amenities to people who choose to drive long distances when so many nearby roads are unused waiting to service their driving needs. The Kensington Expressway is currently getting a resurfacing which is predicted to last about 15 years. NYDOT officials say that the expressway will likely receive a major reconstruction at that time. ?NOW? is the time to start working to take any plan for reconstruction of this highway off the table as an option. ? NOW ? is the time to start talking about its complete removal and replacement with the parkway that is supposed to be there. Elsewhere on the Network today: The Architect’s Newspaper explains how northeast Ohio is trying to get a handle on the sprawl that has devastated its urban areas. Cyclelicious shares the outrageous story of an office park’s attempt at bike-friendliness gone awry. And Wash Cycle asks whether police or reporters should be assigning fault in a collision before an investigation has taken place. Most places in the U.S. still use 20th century metrics to measure the performance of transportation systems. The emphasis is still on moving cars, not improving transit service or reducing traffic injuries. One of the exceptions is DC, where the DOT is letting people assess streets according to a different set of priorities.